Engaged employees mean more revenue, less turnover and a happier workplace. But the truth is that the majority of workers aren't engaged in their roles, and it's costing companies more than lost productivity. A 2013 study from Gallup found that as much as 70 percent of U.S. workers aren't actively engaged in their jobs. Engagement hasn't gotten much better since then, with Gallup's 2015 report showing nearly identical numbers and stagnant growth from 2014, as well as mostly flat growth since 2000. And for new hires, there's an "engagement honeymoon" period, according to another recent report from Gallup -- it found that employees perform the best and are the most engaged within the first six months of starting a new job, and after that there is a fast drop off. But engaged workers are a big commodity to any successful business -- they make businesses more profitable, productive and they lessen turnover. Gallup found that for organizations that averaged 9.3 engaged employees per every disengaged employee showed 137 percent higher earnings per share, while companies with 2.6 engaged employees for every disengaged employee reported earnings 2 percent lower than the competition. Overall, the report estimates that poor engagement at work can cost the U.S. anywhere from $450 billion to $550 billion per year, according to the report. Adam Ochstein, founder and CEO of StratEx, who has spent 15 years working in human resources understands the importance of engagement at work. "Engaged employees mean happy employees, and happy employees serve customers best. Providing great service is important in every industry, and it's hard to get employees who don't care about their job to want to provide great service." You might think that corporate perks and policies can help improve the performance of your employees, but the greatest impact on employee performance stems from engagement. Even if you offer a flexible schedule, unlimited vacation time and free snacks in the breakroom, if your employees aren't engaged, those perks won't actually do much to motivate them. Engagement at work is the biggest predictor for employee success, and engaged workers statistically perform better across the board, according to Gallup's data. Ochstein agrees. "When employees are engaged, they want to stay an extra hour to finish up a project, or read industry-specific content to learn about the latest techniques. They want to get to know their coworkers and clients better. Engaged employees make the office a fun place to work, and positive attitudes are contagious. When employees genuinely enjoy coming to work, the entire business improves." But only 17 percent of these employees are "actively disengaged," according to the 2015 report from Gallup, while just over 50 percent are instead passively disengaged. That's both bad and good news for businesses because disengaged employees are never a good thing. But it's more difficult to motivate people who are actively disengaged and making a choice to "check out," than it is to motivate those who are passively disengaged employees. They might just need the right boost or encouragement to help them get motivated. So potentially getting those 50 percent re-engaged is possible. It might seem easy to point a finger at management if your employees aren't engaged, but employees shouldn't need to rely on management to succeed, says Ochstein. And it's not fair to expect managers to bear the responsibility of keeping every employee engaged on top of everything else in their job description. Some of the responsibility needs to fall on the employees themselves. But that's the case with an engaged manager -- the problem arises when you have a manager who also isn't engaged, which creates a domino effect on the employees below them. "In a perfect world every manager is great and can help employees grow, but we don't live in a perfect world, and if an employee has a bad manager and relies solely on them to excel, they will fall behind. An employee's career is dependent on them, with or without a good manager," Ochstein says. Unfortunately, as Ochstein notes -- we don't live in a perfect world -- so it's important when hiring managers to consider the best qualities a manager should have for your business model. The 2013 Gallup study suggests moving away from offering managerial roles as "promotional prizes for all career paths," and instead treating managerial positions as unique opportunities that "require a specific talent set." Rather than simply promoting people within the department, you should consider if they have the right skills and personality for the job. That way, you'll always be sure you are hiring the right person for this type of role, rather than promoting someone not equipped for management, who might quickly become apathetic. Employees working under a disengaged manager, Ochstein says, should be more vocal about their manager's performance. "Poor performing managers unfortunately sometimes get away with it, which is why employees who are feeling themselves become less engaged, need to speak up. Plus, new managers may not know how to spot disengagement, so they may not notice anything unless the employee speaks up." While employees and managers do have a responsibility to stay engaged, engagement starts at the top of the company, according to Ochstein. If employees see that the C-suite or board aren't engaged, it will trickle down and affect nearly every department. For executives who understand the connection between overall business success and engagement, they will know to set an example for the entire company. As Ochstein puts it, "Executives who aren't engaged themselves, can't expect their employees to be. Engagement starts from the top, and executives serve as the examples to staff as what it means to be engaged. They are responsible for continuing to train middle managers on how to spot and help someone who has lost engagement so that they can best cater to that employee." And Gallup agrees, noting in its Q12 Employee Engagement report that it's typically found that companies that report highly engaged executives tend to also report better levels of employee engagement, especially with long term employees that have been at the company for 10 years or more. For companies that feel this is a weak point -- then persistence is key, according to Gallup's research. The report states that as employees invest in engagement initiatives, overall engagement increases across the company and grows steadily over time. Another issue with engagement is that there really isn't a one-size fits all approach to encouraging employees to feel involved with their careers. Age, tenure and gender can affect someone's view of engagement, and one tailored approach won't work for everyone, according to Gallup's expansive research. There's also the concept that just because an employee is disengaged, it doesn't mean they don't care, according to Ochstein. In fact, a disengaged employee could be suffering through something personal, and it might not be work-related at all. It's important not to jump to conclusions and offend an employee who may be struggling in their personal life by accusing them of being apathetic at work. Ochstein also points out that when a lack of engagement does stem from an employee's work life, it might mean that they're bored, burnt out or just not interested in what they're working on. Bottom line is that, you should never assume you know the reason an employee is showing a lack of engagement, and it should be broached with an empathetic attitude, not an accusatory one. The last thing you want to do is offend an employee and push them away even further, possibly encouraging them to leave the company or remain disengaged. The biggest takeaway about employee engagement is not only that businesses are losing money over wasted productivity, as Gallup has found, but that it is such a rampant problem in the corporate world. 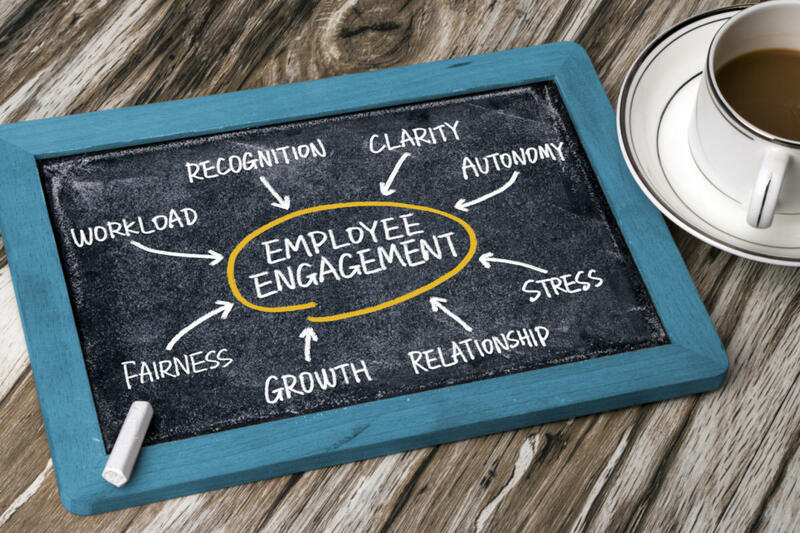 And one of the hardest parts of employee engagement is sometimes even spotting disengaged workers; but the stakes are high for companies that ignore engagement. "It's easy to tell when a hyper-engaged employee becomes disengaged, but sometimes it's not so obvious and happens more subtly. It's important that managers have regular meetings with staff, so they can keep a pulse on broader trends regarding an employee's attitude or work product. Ultimately, there needs to be an honest dialogue between a manager and their staff and if a manager notices a dip, they need to address it right away, otherwise they risk losing that employee," says Ochstein.